As all regular readers of this blog probably know, my wife is recovering from oral cancer and that I worked on the original Microlite74 as way to cope during her recovery from 6 weeks of radiation treatment in 2008. We are some of the 40 to 50 million people in the US who do not have health insurance (don’t get me going on what is happening in Congress now) and do not qualify for government aid as we live in Texas and have no children. The cancer treatments and related expenses have cost over $110,000 so far. While over half of this has been absorbed by hospital foundations and the like (and more was paid with the help of donors last year), we still owe a lot of it. We have established a RetroRoleplaying Cancer Fund for donations. 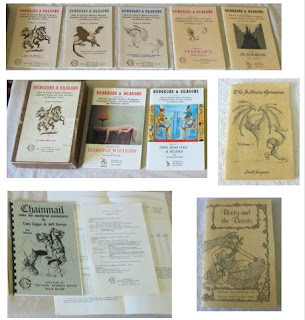 Everyone who donates anything at all (even a dollar) gets access to a few special downloads (like pdfs of two 1970s D&D fanzines, a special edition of Microlite74, and more) as described on that page. We have had a couple of special donation drives in 2009 and thanks to Jamie G.’s donation of a complete set of Brown Box D&D, Booty & the Beasts and Arduin Grimoire #1 — as described in this post from last week, Surprise Delivery: Brown Box Original D&D — we are having another. Anyone who donates from January 15, 2010 to February 15, 2010 (UPDATED: extended from original date of February 5th due to two weeks of major computer issues on my end, see The Computer Is Dead — But The Game Goes On and Frustration thy name is AVAST for details) will be eligible for some extra D&D goodies in addition to the special downloads everyone who donates gets. First, whoever donates the most during this time period will receive the OD&D Woodgrain/Brown Box special: the three LBB (Men & Magic, Monsters & Treasure, and The Underworld & Wilderness Adventures — Third printing purchased with their Brown Box box, Supplement I: Greyhawk (2rd printing), Supplement III: Blackmoor (1st printing, I think) and Supplement III: Eldritch Wizardy (7th printing), and Supplement IV: Gods, Demi-Gods, and Heroes (5th printing). Also included are the table sheets from the brown box set, a copy of Arduin Grimoire Volume I, an almost pristine copy of Booty and the Beasts with its Erol Otus artwork, a copy of Chainmail, and a few cut Dungeon geomorphs. You can see these items in the picture below or in the Surprise Delivery: Brown Box Original D&D post from last week. Thanks to Jamie G. for making this possible! Second, the person who donates the second largest amount will receive a copy TSR’s H1 Bloodstone Pass module. It’s all there but is well-used. The person who donates the third largest amount will receive a copy TSR’s Dungeon boardgame, 1981 edition. The box is in bad shape, the the game itself in in very good condition. booklet (2nd printing — I think — and in nice, but obviously used, condition). Note that this can only be shipped to the USA. Finally, the next three largest donors will get either a copy of TSR 9590 Kidnapped (an RPGA adventure from 1998 in excellent condition, published by WOTC under the TST logo) , a set of Deities and DemiGods (has Cthulhu Mythos, but is very heavily-used), or a well-used and marked copy of The Rogues Gallery. To get help us pay our cancer treatment related bills (and to get access to some special downloads and possibly the above mentioned items), send a donation in any amount — small or large — to me via Paypal. My apologies for having to ask for donations and my heartfelt thanks to everyone who donates. If you cannot donate but wish to help, please spread the word about my request and offer. Thank you very much in advance. Special Note: First, Jamie would like the OD&D material he donated to go a gamer, a collector, or someone who will sell it to a gamer or a collector, therefore the first gift cannot go to foundation — which means even small donations shoild have a fair change of getting something and you will not have to you will not have to outdonate a foundation’s 3K or 4K donation to have a chance at the OD&D collection as happened last July. Second, in the case of a tie for any item, the tie will be broken by a quiz –a set of OD&D-based questions I will create. Donated and posted the link on my blog. Best of luck. Thank you very much for the donation and the link. I just found your blog. I've spent the last two years in treatment for colon cancer. I actually HAVE health insurance and the bills are still insane. At last count, the total cost of my treatments was approaching $170,000. If I didn't have insurance, there would be no chance whatsoever for me to ever get out from under the bill. It has been a long, brutal experience for my wife and I, but it's brought us closer together, it's made us stronger people, and it's given us a true appreciation for the time we have on earth. I'm posting a link on my blog. I wish you and your wife a long and beautiful life together. Unbelievable. I can't even fathom such a thing … I pray that your nation will wake up and realize that the height of civilization is the ability to show compassion for your fellow countrymen. Donated… and hoping for some goodies.